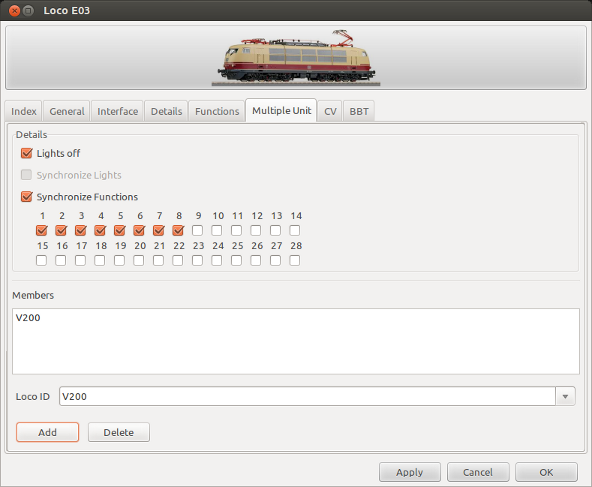 The Multiple Units page makes it possible to create a consist of locomotives with this locomotive as master. All commands sent to this locomotive will be dispatched to all listed locomotives in this consist. Make sure that all listed locomotives run at the same speed as the master of this consist; you probably need to fine tune their CV's using the Program Track. If the master is a virtual locomotive this page can be used for swapping the real locomotive of a consist. All references, actions and so on, are not effected by swapping one or more members which is especially helpful in automatic mode. The lights are not synchronised with the master. If this options is checked the lights of all slaves are always off, otherwise they are always on. Dispatch the lights function from the master to all the slave locos if the Lights off option is not set. Dispatch the selected functions from the master to all the slave locos. Do not include the master as member in one of the slave units to prevent a server loop! All 'slave' locomotives for this consist. By selecting one of the list you can delete it. Add additional locomotives to the consist list by pushing the Add button.